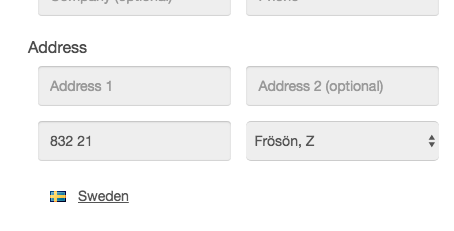 Setting up a store for Sweden and I noticed a small bug when you refresh the checkout page. Tested in Chrome on a mac. Thanks for letting us know. I think we do retain the post code on refresh intentionally, but I'll verify with someone else here. I wasn't able to reproduce the character issue on the latest versions of Chrome/Mac, but I'm wondering if you could let us know the Chrome and Mac OS versions you're using. Could you also whisper the Foxy store domain so we can try to reproduce that issue and get to the bottom of it? Thanks! After a little playing around, I discovered that you probably need to add <meta charset="utf-8"> into your checkout template, below the opening <head> tag. Let us know if you need help finding that. Thanks! That was the fix. Should have realized it was something simple like that. Glad to hear that worked for you. We always want to hear about potential bugs, so thanks for reaching out either way.